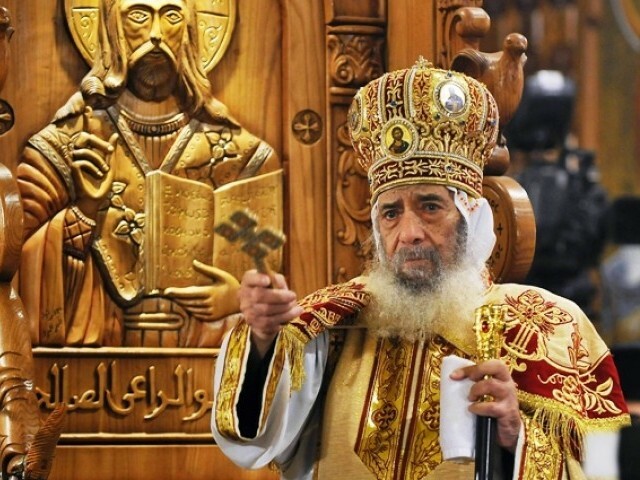 CAIRO: Egypt’s Coptic Pope Shenuda III, spiritual leader of the Middle East’s largest Christian minority, died on Saturday at the age of 88, state media and cathedral sources said. He had suffered health problems for years and recently stopped receiving treatment for liver failure and tumours or swelling in his lungs because he was too feeble, the Coptic Church said. “The last days were the hardest in the Pope’s life, as he was unable to walk,” said a statement carried by the official MENA news agency. Shenuda was forced to cancel a weekly sermon last week over health concerns. There was no immediate official word on when the funeral will be held for Shenuda, who was named pope of Alexandria in 1971, but there were unconfirmed reports it will be held on Tuesday. There was also no word on when clergy and laity would convene to begin the process of choosing a successor. Shenuda led the Copts, estimated at 10 percent of Egypt’s population of more than 80 million, for the best part of a generation, in which Egypt was hit by a wave of Islamic militancy from which he sought to protect his people. Shortly after the announcement of his death, thousands of Copts flocked to the Abassiya Cathedral in central Cairo to mourn their spiritual leader. A crush of people tried to push their way in through a small door into the massive cathedral, as the church bells tolled. Muslim leaders in the country almost immediately sent out condolences after news of his death broke. Shenuda’s death is “a grave calamity that has afflicted all Egypt and its noble people, Muslims and Christians,” the country’s mufti, Ali Gomaa, said in a statement. The Muslim’s Brotherhood Freedom and Justice Party, which controls parliament and the senate, sent condolences to the country’s Copts and described Shenuda as having played a big role in Egypt. Shenuda was placed under house arrest by former president Anwar Sadat for his outspoken criticism of Sadat’s courting of Islamists. But he was supportive of Sadat’s successor, Hosni Mubarak, who was overthrown by a popular uprising more than a year ago which led to an Islamist-dominated parliament — the first in the country’s history. Shenuda, immediately recognisable by his long white beard, was believed to have viewed the widely despised Mubarak as a bulwark against Islamists, who believe non-Muslims should not be allowed to rule the country. He was seen as a check on more radical Copts who urged more forceful reactions to sectarian attacks that have plagued their community, especially after Mubarak’s ouster. He was criticised by his own flock after he blamed “infiltrators” for triggering clashes between Coptic protesters and the army last year in which more than 20 people died, most of them Christians. Many said they wanted him to take a harsher stand against the military, which has been accused of failing to carry out genuine reforms. Copts celebrated New Year and Christmas amid tight security, after deadly attacks two years in a row following services. Shenuda leaves behind a nervous community, a target of frequent sectarian attacks in recent years, who complain of routine harassment and systematic discrimination and marginalisation. Egypt has also seen increased tensions between Muslims and Christians over the past few months, sparked by neighbourhood quarrels and disputes over church building and rumours of forced conversions. Copts have been particularly concerned since Islamist parties, including ultra-conservative Salafi groups, won almost three-quarters of the seats in the first parliamentary elections since president Hosni Mubarak was ousted in a popular uprising. Theologically, Shenuda was conservative, slamming a court decision calling on his church to allow divorce. Shenuda’s community is one of the Oriental Orthodox churches that are not in communion either with the Roman Catholic Church or the Eastern Orthodox churches because of a 5th century disagreement over the nature of Jesus. However, the pope maintained a keen interest in promoting church unity. He served as head of both the World Council of Churches and the Middle East Council of Churches, and founded churches in several African countries.